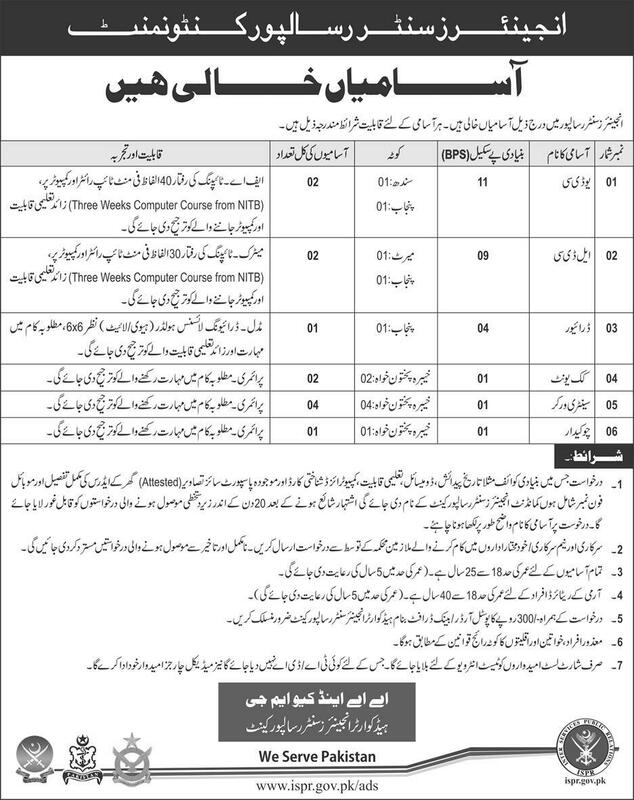 Engineers Center Risalpur Cantonment has announced 12 New Jobs in Daily Express Newspaper dated 09-04-2018. Candidates who have required Qualification and Experience may apply for jobs for Civilian Jobs in Pakistan Army 2018 against the post of Upper Division Clerk (BPS-11) 02 Posts, Lower Division Clerk (BPS-09) 02 Posts, Driver (BPS-04) 01 Post, Cook Unit (BPS-01) 02 Posts, Sanitary Worker (BPS-01) 04 Posts, Chowkidar (BPS-01) 01 Post. Government or Semi Government Employees should send their application through Proper Channel, Incomplete or late Received Applications will not be entertained.